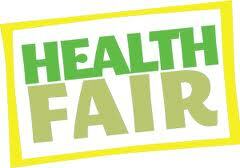 Join us and lots of other great exhibitors this Saturday, March 2, at the Highland Health Fair. It's free and open to the public! It will be held at Highland High School (4150 Ridge Road in Medina) from 9am to 1pm. At our Century Cycles table, you can register to win a Century Cycles Gift Card and get helpful bicycling information. The Highland Health Fair will also offer health screenings, games and activities for children, and the chance to talk one-on-one with Cleveland Clinic specialists. Screenings and activities include: blood pressure, bone density, body composition, stroke risk assessment, speed and agility testing, the Teddy Bear Clinic, therapy dogs, Reiki healing, “Ask a Pharmacist,” and much more! For more information, call 330.721.5992. 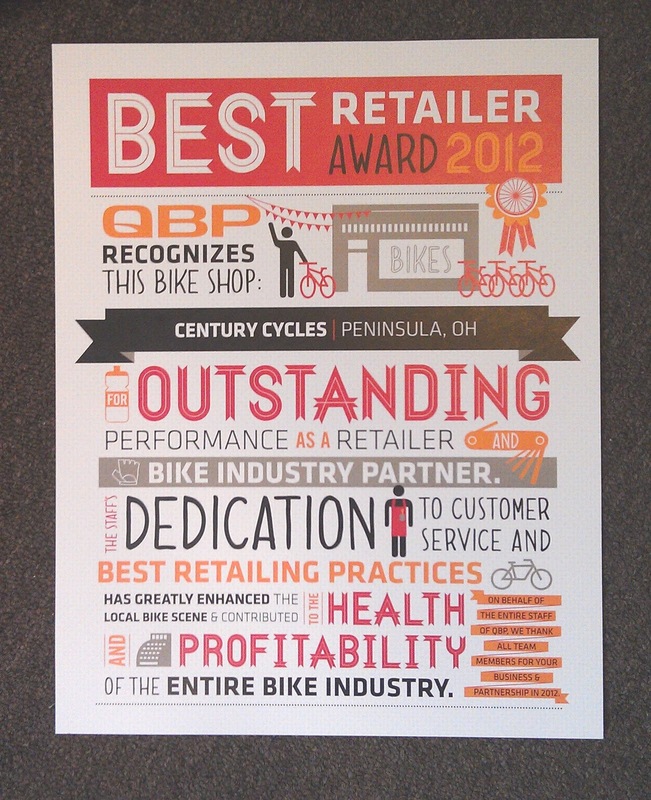 THE BIGGEST has awarded Century Cycles as THE BEST! 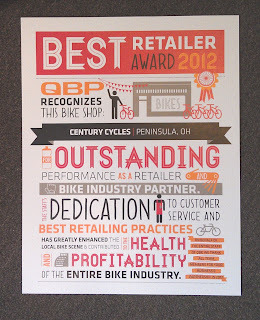 We are honored and grateful to share the news that Century Cycles won a Best Retailer Award 2012 from QBP (Quality Bicycle Products) -- the bike industry's largest distributor of bicycle parts and accessories and the manufacturer of Surly Bikes. Many, many thanks to QBP and Surly! Almost every day we are in touch with QBP or Surly on behalf of our customers, and we couldn't provide our level of customer service without their commitment to customer service. 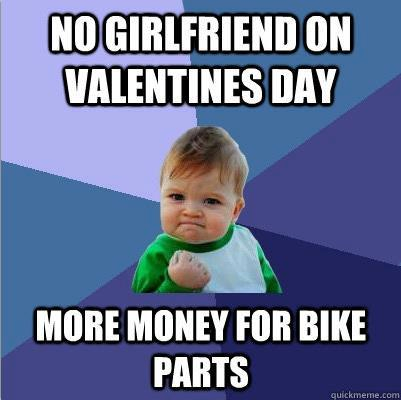 It's a match made in bike heaven. This accolade was a proud and happy addition to our Awards & Honors wall! Thanks again, QBP and everyone -- customers, friends, family, and the most awesome staff on the planet -- who makes the best-ness possible. Four clinics remain; four chances to win! 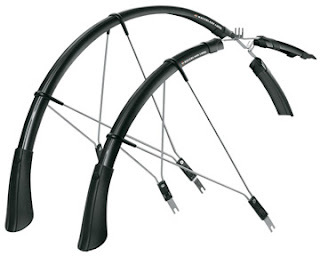 Win these terrific SKS Raceblade Long Board Fenders (a $59.99 value) at tonight's Bike Commuting 101 Clinic -- ideal for anyone using their bike to ride to work, school or errands! At the clinic, learn tips to get started and stay motivated. You can also win a SKS S-Blade Rear Fender (a $19.99 value) at next Tuesday's Riding in Traffic Clinic on March 5. Our staff will share how they take the lane, navigate turning lanes, see (and are seen by) motorists, and much more. At this Thursday's Preparing For and Riding in the MS 150 Clinic and the final Basic Bike Maintenance Clinic on Thursday, March 7, we have a great giveaway from Shimano and Pearl Izumi for each clinic for attendees -- the highly-anticipated Shimano Click'r Pedals and highly-popular Pearl Izumi Fuel Road Shoes, a combined value of $170!! Winners will be notified via email the day after each clinic. All the clinic details are at www.centurycycles.com/goto/clinics. See you there! It's 1986. Young BMX racer Cru Jones faces tough decisions: Race on the Helltrack or take the SATs? Perform freestyle bike stunts on the dance floor or dance? You may be able to guess what he decides because: Cru is...RAD. 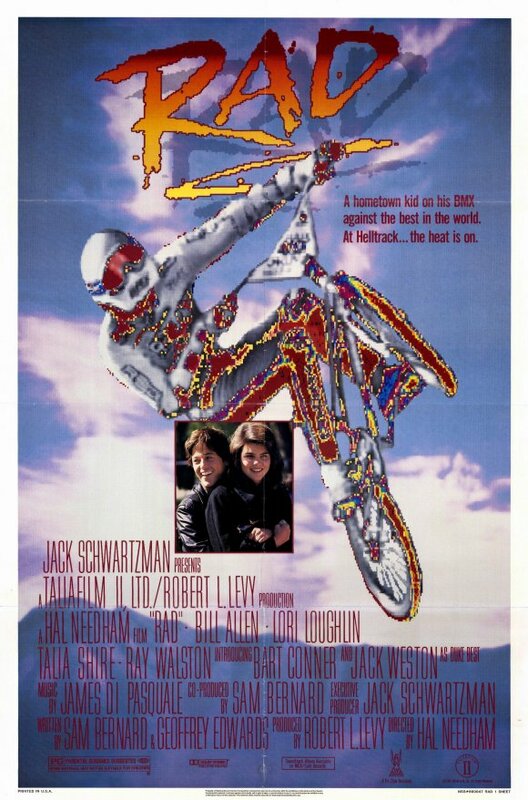 We'll be showing "Rad" at our Like Totally Rad Spring Kick-off Party this Friday, March 1. 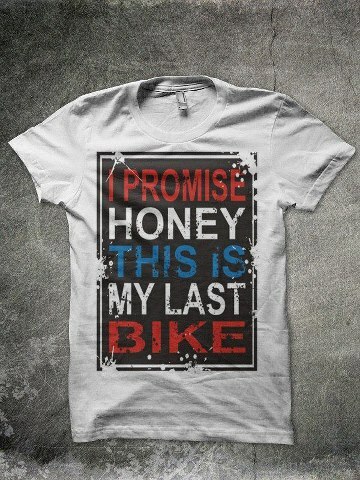 And we're not the only ones with a soft spot for this BMX cult classic. On Facebook, Brett Rockwell commented, "I watched the riders during the credits incessantly. Learned a TON of tricks. These were the days before Internet, YouTube and DVD. Everything was tape. *Good* times." "American Flyers" -- which you can check out when you come kick off spring with us on March 1 -- hit theaters in 1985 and grossed just $1.4 million. It stars Kevin Costner before he became an award-winning superstar and is rather hard to find on DVD. Pre–Bull Durham Kevin Costner in a mustache is one thing, but Rae-Dawn Chong’s wheel change is the real stunner in this fun story of two brothers who tackle the Hell of the West through the Rockies. Some of the details are ludicrous—the way the Russian pros bob and weave as they attack—but as celebration of the 1980s American cycling scene, with appearances by the 7-Eleven Team and the gone-but-missed Coors Classic, it’s worth your time. Kevin Costner's mustache is "one thing," which is why it inspired our Gnarly Mustache Contest at the party (commence a'growin'!). Besides the 7-Eleven team (which had Bob Roll -- a Century Cycles favorite! -- on its roster), the movie also has a brief appearance by the legendary Eddy Merckx. Keep an eye out for him starting stage 1. Define your life. Ride a unicycle! Century Cycles has UNICYCLES? 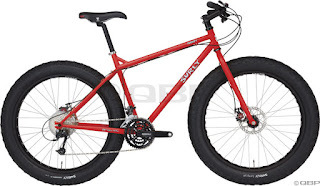 We've got them in stock in three sizes: 16-inch, 20-inch, or 24-inch wheels. 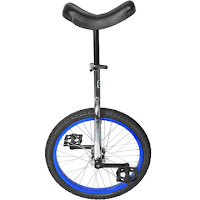 This one-wheeled pedaling machine may not be for everyone, but if unicycles are your thing, we've got you covered! To prove it, Ed Meyer and Christopher Lenaghan showed off their unicycling skills around our flagship store in Medina, and our resident BMXpert® Chris Walters caught it on video. 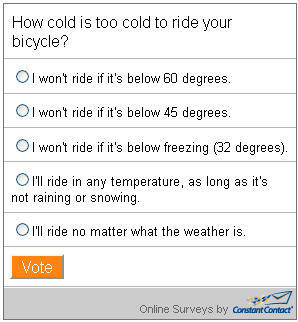 Online Poll: How cold is too cold to ride your bicycle? take our latest online poll. With all of this talk recently about snow bikes and winter riding, just how many of you ride in cold weather? 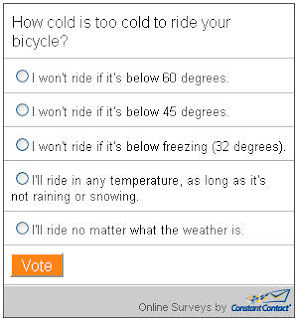 How cold is too cold to ride your bicycle? Click here to take our latest online poll and let us know! Last month's poll asked, "How do you begin your bike ride?" Mounting from the left side is the clear favorite, with 78% of responses "Standing start, mount from left side" and 12% "Running start, mount from left side." You can see the full results of the last poll here. Whether you commute by bike year-round, or just want to try to continue to train in the off-season to keep your fitness up, riding your bike in winter weather presents its own set of challenges. 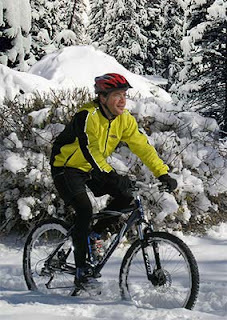 Just like the old tale that says that Eskimos have 12 different words for snow, there are probably 12 different techniques for riding in varying winter conditions. As with all skills, there's no substitute for experience, and practice makes perfect. Here's a few tips to help get you started. You'll want to dress for the weather, of course, with more and/or heavier layers the colder it is. You'll be working hard while pedaling, so you'll want to wear breathable fabrics to manage moisture. If you sweat too much, you'll end up colder in the long run. As a general rule, if you're comfortable when you first step outside, then you'll be over-heated about 10 minutes after you start your ride, so get used to being a little chilly at first, and then warming up gradually. You'll probably want to dress a little heavier than if you were running outside in the same weather, but lighter than if you were doing a less-strenous outdoor activity, such as hiking or downhill skiing. In general, use the three-layer system for dressing in winter. The first is a base layer, a thin or mid-weight garment that fits close to your skin made of a wicking material, such as polyester or wool. Next, add an insulating layer, a mid- to heavy-weight layer of polyester, fleece, or wool that helps trap and hold your body's warmth. Then, put on a water-resistant or waterproof barrier layer to keep the wind, rain, and snow on the outside. On your legs, wear insulating tights and/or waterproof shell pants. Use a skull cap or balaclava to keep warm under your helmet, and a helmet cover to keep the wind and moisture out. For your hands, there are heavyweight winter cycling gloves available, some with separate liner gloves for quicker drying post-ride. On your feet, don't layer up with multiple socks, as the increased bulk may cut off your circulation and make your feet colder. Instead, use slightly heavier wool socks, and shoe covers to keep the elements out. Dressing in layers allow you to add and remove layers to adapt to changing conditions. For more information, listen to the Radio Century Cycles Episode 10, where Chip Ellison, sales representative for Pearl Izumi, discusses with the host, our own Bob Soroky, the technologies and techniques for dressing using the three-layer system. Pedaling through several inches of freshly-fallen snow can very strenuous and tiring. It's also much slower than usual; figure on going at least half your typical speed, or even less. You'll be using your lower gears a lot more often and your higher gears not as much. Studded tires offer little to no benefit in deep snow. 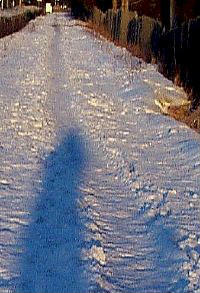 However, wide snow-bike or fat-bike tires (4 to 5 inches wide) excel in these conditions. Keep your weight centered between your wheels, and brake evenly with both hands as you would in normal conditions. It may seem counter-intuitive, but it's usually easier to make your own track in fresh snow, rather than trying to follow somebody else's track who came before you. It's takes 100% of your concentration to steer within an existing track, and if you veer off, you'll either get knocked sideways by the edge of the track, or you'll sink deeper as you roll off the slightly compressed center of the track. Look for undulations in the surface of the snow that will indicate hidden obstacles underneath--it's like looking at the regular road or trail with blurry vision. For example, a large depressed circle of snow may mean a pothole. A raised ridge of snow could be a large crack, or even a fallen branch or log. The upside of riding in deep snow is that things seem to happen in slow motion. If you start to veer sideways or lose your balance, you'll have more time than you think to make corrections. Just keep powering with your pedals and try to correct your steering, and resist the urge to put your foot down, and you'll probably recover, albeit at a slow speed. If you do have to dab a foot on the ground once in a while, no big deal, just keep going. If you do fall over, at least it's a softer landing! Hardpack snow can be the easiest condition to ride in, but it can also be the hardest. In the best-case scenario, hardpack snow has been compressed by previous traffic to a smooth, even layer. It may even be mixed with dirt, gravel, or cinders spread by road crews. This mixture provides enough traction that you can get a good grip even without studded tires, but studs won't hurt. In the worst-case scenario, hardpack snow is an unpredictable combination of compressed snow, soft new snow, and ice. Existing tire tracks will be even more dangerous and difficult to follow than those in fresh snow; the edges will be harder and more likely to "railroad" you in an unintended direction. If you do get caught in a track, try to bunny-hop over the edge, rather than ride it. For tracks going across your path, approach them the same way as you would railroad tracks, that is, turn slightly so that you cross them as close to perpendicular as possible. When riding in hardpack on multi-use trails, tracks from hikers, snowshoes, and even horses provide an added level of challenge, as they create ridges and depressions of varying sizes and unexpected locations. This is where your mountain-biking skills come in handy, as it helps if you can take all of the rough stuff fast enough so that your tires just skim over the top of all the bumps, rather than getting hung up in the holes. Gauge your speed carefully, however, as you want to still be going slow enough to be able to maintain control should you hit a patch of smooth ice. For maximum traction, lower your tire pressure to the minimum recommended pressure. Go even lower if you feel you can ride with enough finesse to avoid pinch flats. Smooth, solid ice can be the most tricky and most dangerous surface to ride on. Be especially on the lookout for "black ice," so-called because it's actually clear, and takes on the color of the pavement underneath. The main trick for riding on ice is to try to keep your bike as vertically upright as possible. During turns, slow down much more than usual, and don't lean into the turn as much as you normally would. One reason that you don't lean into turns on ice is so that more of your tire remains in contact with the road. However, the main reason is that the more you lean, the more that lateral (side-to-side) forces come into play between your tire and the road, as opposed to vertical forces. It's more likely that lateral forces will be overcome by the centrifugal force of your turn, and thus more likely that you'll slip over on the ice. Slow down enough BEFORE the turn so that you DON'T have to apply your brakes DURING the turn. 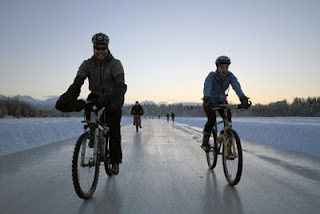 Riding on ice is one situation where you break one of the normal rules of riding. Your front brake is much more powerful than your rear brake. Thus, you want to AVOID using your front brake on ice. The more likely you are to keep your front brake from locking up, the more likely you are to remain upright. When braking on ice, use your rear brake gently, and shift your weight back for increased traction on your braking wheel. If possible, at the beginning of each ride, do a test do find out how much pressure it takes to lock up your rear wheel. While moving in a slow, steady pace on a straight stretch of road or trail, away from traffic, squeeze your rear brake lever VERY gradually until your rear brake locks up and your rear tire starts to skid. Then try to avoid applying that much pressure later. If your rear wheel does lock up occasionally, as long as you're going in a straight line and your front tire keeps traction, you should be able to maintain control. The most important thing to remember is that it's just as important to replace fluids lost due to sweat during cold weather as it is during hot weather. That being said, many winter cyclists find that they don't drink as much during winter riding compared to summer riding. This may be because winter rides are typically much shorter, and that they don't sweat as much in the same amount of riding time during the winter. The main problem to deal with during winter riding is keeping your water or sports drink from freezing. Even in sub-freezing temperatures, you've probably got about 30 minutes of riding time before your water bottle freezes to the point where it's un-drinkable. That may be enough for short commutes and errands. One solution for longer rides is to keep your bottles in a trunk bag or pannier, perhaps wrapped in a spare jacket or towel for insulation. Another method is to stuff them inside your outer layer of clothing. If you use a hydration pack, after taking a drink, blow the water from the drinking tube all the way back into the bladder to keep the tube from freezing. 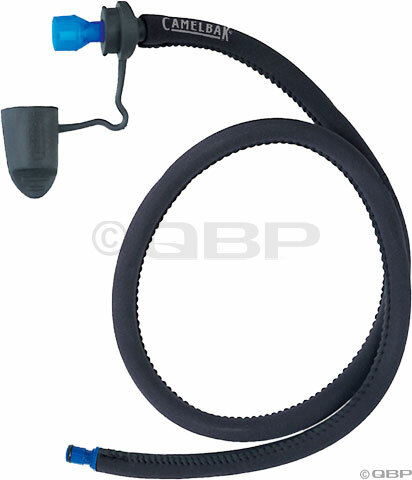 Or, you can purchase a cold weather kit that insulates the tube and mouthpiece to keep them from freezing. Of course, repeated riding in wet weather, plus road salt, can wreak havoc on a bike's frame and drive train, so be sure to wash your bike often and clean and lube the chain on a regular basis. The world-famous Ray's MTB Indoor Park opened to much fanfare in Cleveland, Ohio in the fall of 2004. Founder Ray Petro was just a avid mountain biker who was frustrated with not having trails to ride during Northeast Ohio's cold, wet, and snowy winters. So, working on the "if you build it, they will come" principle, he found an old parachute factory on Cleveland's West Side, and began building indoor trails and features that he would want to ride, creating the first indoor mountain bike park in the world. 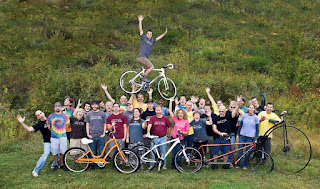 Since that time, Ray's MTB has expanded to a second location in Milwaukee, Wisconsin, and inspired others to open similar parks in cities around the world, from Pittsburgh, Pennsylvania to Portland, Oregon, Canada, and Europe. The park offers a large variety of terrain for every level of rider, from the beginner to the advance expert. All areas are clearly marked, so it's easy to find your way around without getting accidentally in over your head. Other areas include a pump track, and the Rhythm Room, which is dedicated to urban-style jumps and tricks, with a curved wall arount the outside, and several ramps with tabletops in the middle. The Cross-Country Loop is the longest continous trail; it runs around the perimeter of the building, and most closely duplicates the experience of riding a singletrack trail in the woods. Ray's MTB also offers free bike skills training sessions (the "School of Hard Knocks"), bike rentals, a do-it-yourself bike repair station, a lounge area with a large, cozy fireplace, the Black Box Lounge (which can be rented for private events), large-screen TVs, and spectator overlooks. The staff of Century Cycles enjoys all kinds of on-road and off-road cycling, and Ray's MTB Indoor Park is no exception. All three of our stores have rabid fans of Ray's; here are some of their favorite ways to enjoy Ray's and their insiders' tips. 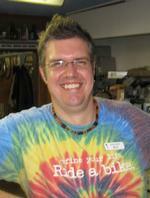 Chris Walters from the Medina store started riding at Ray's in the fall of 2011. He purchased a season pass this year, so he can stop by whenever the urge hits him. He'll often go after school or before work with Christopher Lenaghan (also from the Medina store and a Ray's season pass holder). He rides a Haro Steel Reserve 1.1 dirt jump bike, and spends most of his time in the Rhythm Room or in the Cross-Country Loop. Chris's recommendation for first-time visitors to Ray's is to allow enough time to explore--the place is bigger than you think. Go on a weekday; get there when they open at noon, and you'll have the place practically to yourself. His other big tip is safety! Chris wears a standard BMX helmet, gloves, and a Brain-Pad, which is a mouth guard of the type used by mixed martial arts fighters. Rich Oettinger from the Peninsula store has been going to Ray's on a regular basis throughout the past several winters. He rides his 2010 Giant Reign 1 full-suspension mountain bike. He also likes getting a season pass, because it comes with free bike storage for the season, so all he has to do is show up and ride. Not to mention the fact that a season pass costs about the same as a membership to his local gym! He enjoys the riding the Sport section the most; it's got about a dozen different lines you can take, including a rock garden that's about 50 feet long, which makes it feel like riding a real rocky trail in the woods. Rich also likes going to the Rhythm Room just to watch the experts doing tricks there. Rich suggests that if you're a first-timer to Ray's, start at the beginner sections and work your way up from there, even if you're already an intermediate to advanced rider. He also stresses safety--use the elbow and knee pads provided free of charge by Ray's! Rich also uses a full-face BMX helmet. Last but certainly not least, Dan Ward, a bike mechanic from our Rocky River store, has been involved with Ray's from the very beginning. A close friend of Ray Petro, Dan has helped with marketing, graphic design, and trail design for the indoor park since its founding. Dan rides a couple of different older mountain bikes at Ray's. Dan likes to ride the Rhythm Room and the Cross-Country Loop, but his favorite part of Ray's MTB Indoor Park is the fun, family-friendly atmosphere. You'll find kids aged 4 or 5 years old, up to folks in their 60s and 70s, and everyone is always quick to chat and offer tips and advice. He also enjoys the many special events planned at Ray's, such as demo rides with professional riders, and the annual Women's Weekend (going on RIGHT NOW!). Dan has seen the terrain features at Ray's evolve from the early days up through the present. He is amazed at how much work is done every summer to redesign and improve the park. Several years ago, a deck was added at the beginning of the Sport section, which led to several options for intermediate-level trails. The staff at Ray's noticed how riders' habits evolved over time, specifically that people would stop on the deck, catch their breath, and watch other rides before they took their turn. The deck was so popular, that decks have been added to almost every other section since then. The most significant change every year is that more and more beginner-friendly trails are added every year. So, give it a try, because it's not as intimidating as it looks. And, if you've been there before and thought it was too much for you to handle, try again, as there's bound to be new stuff that you'll be able to tackle with no problem! Ray's MTB Indoor Park is located at 9801 Walford Avenue, Cleveland, Ohio 44102. Check out more information, photos, videos, and events at www.raysmtb.com. The Greater Cleveland Sports Commission, in cooperation with Bike Cleveland, is investigating the plausibility of creating a multi-disciplined, all-skills-welcomed, cycling-themed event, centered in and around the city of Cleveland’s fantastic resources! All responses are confidential, and no personally identifying information will be collected. 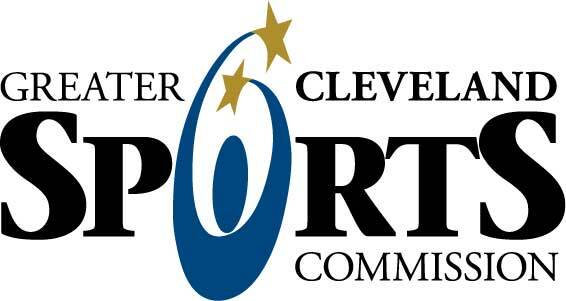 This is your opportunity to directly influence the future of cycling in Northeast Ohio! Your time and responses are GREATLY appreciated; thank you! 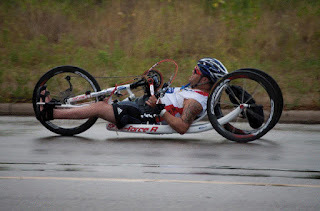 The organizers of the wheelchair/handcycle division for the Rite-Aid Cleveland Marathon (May 19, 2013) and the Hall of Fame Marathon in Canton (June 15, 2013) are in need of bicycling volunteers. Each wheelchair/handcycle racer will be assigned three cyclists as safety escorts. The team of three cycling volunteers will communicate with each other and their racer. Remember that the racers sit very low to the ground, which prohibits them from seeing far down the course (see pic below). As a volunteer, if you are behind the racer, you are his eyes down the marathon course. Therefore, the cycling volunteers need to tell the racers when turns are coming and at times best way to go around traffic, with safety of all being the first concern. The front cycling volunteer will clear the marathon course so that the racer can keep momentum and move through the crowd. It is also crucial for the front cycling volunteer to stay far enough ahead to make others aware of an upcoming racer, but also making sure a gap does not occur. The cycling volunteers may be asked to keep a pace of 12 to 22 miles per hour. Volunteers will also need to be able to change both tubular and clincher tires. Each racer will carry necessary equipment to complete such a task. 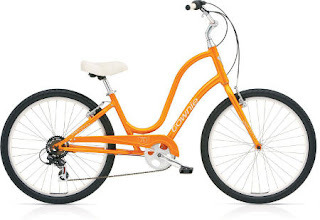 Purchase one of these qualifying models of Raleigh Bicycles between Feb. 1 and March 31, 2013 and receive a $100 Prepaid Card by mail from Raleigh! After your purchase, go to www.raleighusa.com/2013-carbon-rebate/ to fill out the online form and claim your rebate! 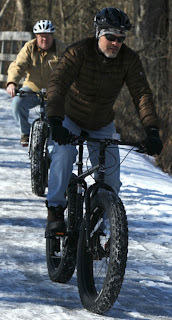 Snow Biking Clinic a Huge Success! A big thanks to the 15 people who came to the Century Cycles store in Peninsula this past Saturday for our Snow Biking Clinic. It was our most popular clinic this season! Attendees learned about snow bike technology, got tips for riding on snow and ice, and enjoyed test-riding the Surly Pugsley and Surly Moonlander snow bikes. The sun was shining, making for a beautiful day to ride outside, but there was still plenty of snow, ice, and slush on the Towpath Trail to make for ideal snow-bike test-riding conditions! Special thanks to Jim Carney, staff writer, and photographer Ed Suba Jr., both of the Akron Beacon Journal, who also came to check out the clinic. You can check out the photos below, and read the article here. Speaking of clinics, we've still got plenty of our FREE Bicycling & Maintenance Clinics left on our calendar for this year. See www.centurycycles.com/goto/clinics for the full schedule and descriptions. Tuesday, February 12 -- The Peninsula store will be open 10:00am - 6:00pm. The Medina and Rocky River stores will be open 10:00am - 8:00pm as usual. 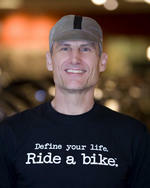 This is the evening of our FREE Tandems 101 Clinic in Medina! See www.centurycycles.com/goto/clinics for more details. Wednesday, February 13 -- All three Century Cycles stores CLOSED for our annual staff training day. Sorry for any inconvenience! Thursday, February 13 -- The Peninsula store will be open 10:00am - 6:00pm. The Medina and Rocky River stores will be open 10:00am - 8:00pm as usual. No clinics at any store this evening; Happy Valentines Day! And don't forget, this Saturday, February 16, we'll be holding our most popular clinic, Basic Bike Maintenance, at all three stores at 1:30pm. Learn how to do a pre-ride safety check, what to carry on every ride, and how to change a flat tire. FREE and no RSVP required. Our FINAL Hot Deal for Cold Days! Last weekend, Punxutawny Phil didn't see his shadow on Groundhog Day, which means that we should expect Spring a few weeks earlier this year! So, to help you get ready for the sunshine, and to make sure you'll see YOUR shadow (and anything else on the road or trail), we're offering this 50% Off Hot Deal on two great pairs of Tifosi Sunglasses. Three sets of easily interchangeable impact-resistant polycarbonate lenses: Smoke Gray with Glare Guard for bright conditions, All-Conditions Red, and Clear (perfect for our Night Rides on the Towpath Trail). Click on the product links below for instructional videos for swapping out the lenses. Eclipse hard case and soft cleaning/storage bag included. The Tifosi Tempt fits small to medium-sized faces, and features lens vents for fog-free vision, and weighs only 26 grams. The Tifosi Wisp fits extra-small to small-sized faces, and weighs in at a scant 22 grams. This Hot Deal is good only February 7 - 20, 2013, while supplies last. In-store purchase only; no online or phone orders accepted. No coupon necessary. 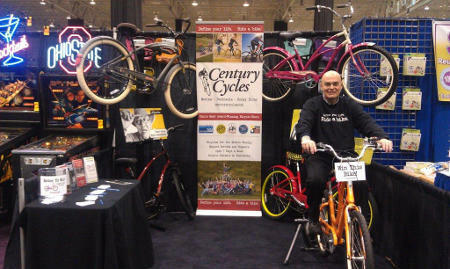 Visit Century Cycles at The Great Big Home & Garden Show! We're halfway through this year's Great Big Home & Garden Expo, and we've been enjoying talking to all of our friends, both old and new, visiting us at Booth #1106 at Cleveland's I-X Center. 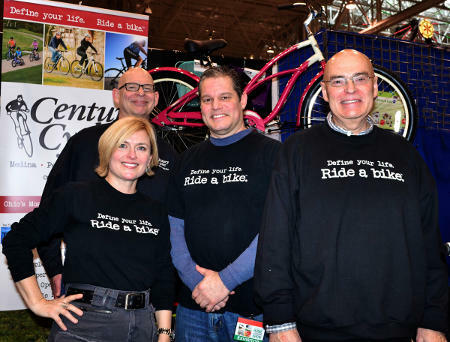 Everyone who stops by our booth can enter to win an Electra Townie 7D bicycle, courtesy of Century Cycles and Electra Bicycles! The winner will be picked in a random drawing after the show, and notified by email. Haven't been to the show yet? Tickets are $14 each at the door, but it's not too late to save $4 by purchasing online! The regular online price is $11 per ticket, but enter to promo code LoveMyBike to get them for $10 each! Click here for the online ticket store. Electra Townie Original 7D bicycle on a stationary trainer. Congratulations to our Clipless Pedals Clinic Prize Winner! Congratulations to Craig Butler! 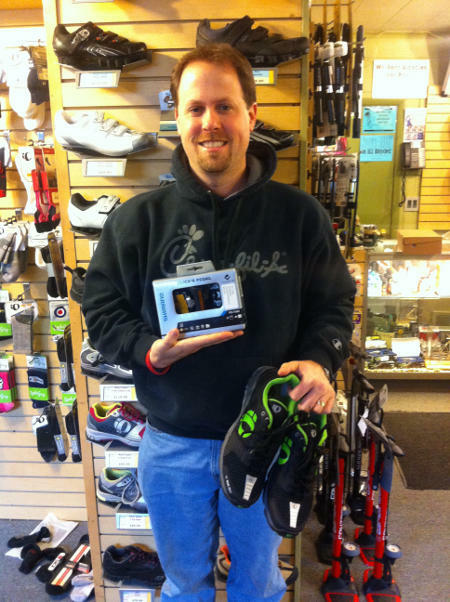 He attended our recent Choosing and Using Clipless Pedals Clinic in the Century Cycles store in Peninsula, and was the winner of our drawing for a pair of Shimano Click'R Pedals and Pearl Izumi Fuel Shoes! Preparing For and Riding in the MS 150 (And Other Event Rides) - Long charity rides and multi-day events take preparation and planning. We will share our best training tips, accessory must-haves and checklists to help you succeed. Basic Bike Maintenance - Our most popular clinic! Learn the basic skills every bicyclist should know: How to fix a flat tire, do a pre-ride safety check, and what to carry on every ride. The forecast for the coming week calls for more COLD and more SNOW. That's mean one thing to us--it's time for our SNOW BIKING CLINIC! We'll talk about snow bike technology, tips for riding in the snow, and you'll get a chance to test-ride the Surly Pugsley and Surly Moonlander snow bikes! Bike Touring 101 - Planning a bike adventure near or far? This clinic will help get yourself, your bike and gear, and your route prepared for self-supported bike touring - from sub-24-hour overnights to weeks on the road. Cleaning/Lubing Drive Trains - How to clean and properly lubricate your bike's drive train (i.e. its chain, gears, and derailers) to extend its life and improve your bike's performance.